The kitchen has become the focal point of the modern home for everyday living and also entertaining family and friends. The kitchen has become a multipurpose room. It is no longer just where food is cooked. It is where homework is done, bills are paid, and the family comes together. Even the process of cooking itself has become a participatory event. The kitchen is the most utilized room in the home. So, we want the kitchen to be stylish and aesthetically pleasing as well as entirely functional, comfortable and with plenty of storage and great work space. Where to start with a kitchen remodel? Depending on the home, the most dramatic and effective improvement not only to the kitchen but to the entire space is the careful removal of walls, raising of ceilings and re-engineering of roof supports in order to create a “great room” effect. This can be surprisingly inexpensive. Where to go from there? Consider the kitchen design elements listed below, all of which need selection and orchestration. Please also refer to our more technical piece on kitchen design principles and the Illinois Rules. getting in each other’s way. Food prep becomes a social event. We create a work station simply by providing counter space within easy reach of an appliance or sink. The easiest way to do this is by adding a kitchen island. The further addition of seating at the island creates a conversation center or somewhere to do homework or handle household correspondence. The addition of an island completes the design of the basic kitchen infrastructure. We now turn to the finish items. Cabinets are the most costly of the finish items but range widely in cost depending on whether they are custom, semi-custom, or from stock. They also vary in wood and finish options and in the mechanics of their drawers and hinges. When selecting cabinetry pay close attention to storage options, especially a Lazy Susan to maximize the use of otherwise lost corner space. Consider drawers versus cupboards. Of course, cabinetry is our strength. These are potentially the next most costly finish items. 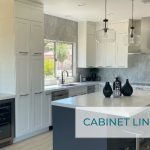 While less expensive laminate options are available, if you are going to the expense of a remodel anyway, it is best to choose the more durable and beautiful materials, such as granite, especially if eventual resale is a consideration. Counter tops are typically complemented by custom back splashes in a matching or contrasting material. As with counter tops, if you are going to the expense of a remodel anyway, tile or hardwood should be preferred over less expensive vinyl flooring. A good looking tile can be surprisingly inexpensive. On a side note, while carpeting is appropriate for bedrooms, many people prefer to carry the same tile or wood used in the kitchen throughout the home. These come in cast iron, stainless steel, fiberglass and plastic and in a variety of sizes and features (single-bowl, double-bowl, deep or shallow). They are top mounted (where a flange at the top edge of the sink sits on top of the counter) or under-mounted (where the surface of the counter sweeps directly into the sink. Faucets come in a variety of finishes (polished brass or nickel, brushed nickel, chrome, stainless steel, oiled bronze). Faucet options include pull-out sprayers, single-levers, double-handles and pot fillers. These are free-standing or built-in, if space is at a premium. Refrigerators are full depth or counter depth, side-by-side or with top or bottom mounted freezers. Range options include gas or electric (halogen or smooth top). Ovens are single, double and/or convection. Appliances also include microwaves, disposals, dishwashers, range hoods, down-draft vents. Bear in mind that when developing a budget for a kitchen remodel the single major factor affecting the budget is the cost of the finishes and fixtures you choose. The cost of the labor does not change. The key to a successful kitchen remodel is in developing an appropriate scope of work and in the selection of materials and products. Our Kitchen Check List can help you do this. You might also want to look at our General Remodel Check List for an overall look at planning a remodel. Click here to send for it.